In conjunction with its cultural presentation for Black History Month, the President’s Leadership Council (PLC) sponsored a lecture by Ethel Tompkins, Hoxie native, on the integration of the Hoxie School in 1955. A total of 25 African American students initially entered the school system, but 21 of the students remained enrolled in the 1,000 -student school. Tompkins was one of the 21. Retired from the Hoxie library, Tompkins devotes much of her time telling the story of the “Hoxie 21” and the successful and mostly peaceful integration of this northeast Arkansas school district. It is an integration that occurred two years before the much more widely known “Little Rock Nine” entered Little Rock’s Central High School with the National Guard called out to maintain the peace and ensure the safety of the African American students. Mrs. Tompkins explained that the opposition which surfaced at Hoxie was largely directed toward the local School Board, whose courage she praised, while in Little Rock, the 1957 desegregation became highly politicized. The cultural presentation, held last week in the Student Lounge in the BRTC Administration, opened with a performance of “Amazing Grace” and “How Great Thou Art” by the Kimbrough Choir, with soloists Rachel Koons and Emily Copeland, and a duet by Koons and Joniece Trammel, Choir Director. Also highlighting the presentation were selections from African American poets by English Club Advisor Lisa Inman and three members of the club, Michael Secrest, Shelby Borst, and Jason Moseley. Moseley also served as emcee for the presentation. Pat Johnson, Chair of the Eddie Mae Herron Center, acknowledged appreciation to BRTC for the college’s longstanding support of efforts to preserve and promote African American history and culture. BRTC President Dr. Wayne Hatcher expressed his appreciation to the PLC and others, and introduced Mrs. Tompkins. 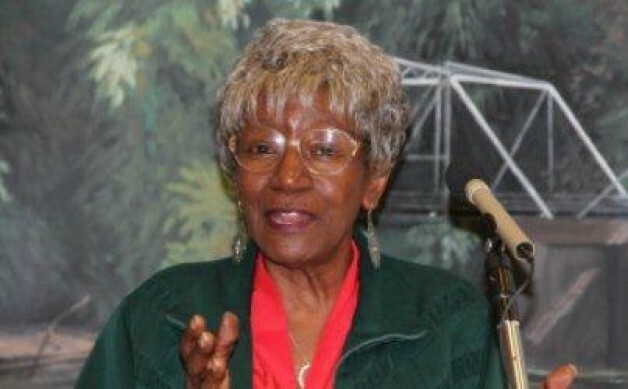 Mrs. Tompkins told the audience that thenHoxie School Board member Howard Vance cited three reasons for the unanimous vote by the School Board to integrate the year after the landmark Brown v. the Board of Education of Topeka in 1954, which ruled that the “separate but equal” provision from the 1896 Plessy v. Ferguson case be overturned. The reasons Vince gave were these: “It was right in the sight of God, it complied with the Supreme Court ruling, and it was cheaper for the school system.” Tompkins explained that the Hoxie district was financially responsible for providing certain items for the education of the African American students. Even though the books were not new ones and the building was substandard, without even water or restrooms, providing things like a bus to transport the African American students to Booker T. Washington School in Jonesboro after they completed eighth grade in their oneroom Hoxie school still posed a financial hardship on the Hoxie school. Though the integration was much less troubled and heated than the Little Rock experience, it was not entirely smooth, Mrs. Tompkins noted. LIFE Magazine recorded the event; its coverage drew the attention of segregationists from other areas. These individuals attempted to thwart the integration with legal action and threats to the School Board and others, but did not prevail. It is Tompkins’ goal, she explained, to raise awareness of this groundbreaking historical event. In fact, a monument on the grounds of the capitol is planned, so that people know not only about the “Little Rock Nine,” but also about the “Hoxie21.” She brought with her an exhibit of photos, articles, and a copy of that 1955 issue of LIFE Magazine that was intended to showcase a “seamless process,” but inadvertently incited problems.